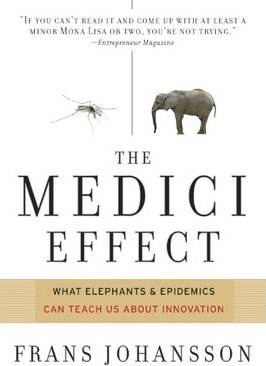 The Medici Effect is a book about creativity and innovation written by Frans Johansson. The name alludes to The Medici family that helped to spur the beginning of the Italian Renaissance. The Medici Effect is about what happens at intersections, crossroads between different and often unrelated knowledge areas. Frans Johansson argues that innovations occur when people see beyond their expertise and approach situations actively, with an eye toward putting available materials together in new combinations. The book contains examples from different areas plus tips around how to achieve the intersectional effects. Update on January 16, 2008. Brian Clark at Copyblogger got inspired by this book and wrote The Content Crossroads: Supernatural Success at the Intersection of Ideas. Posted on October 28, 2006 by BengtPosted in Bits and piecesTagged Books, Change, Creativity.